This is the Quickstart preview, distributed as a free PDF. 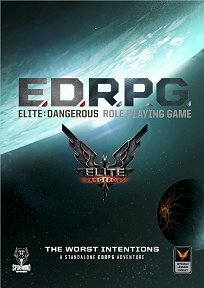 Publisher's blurb: "The main purpose of this free 50 page sampler The Worst Intentions for the Elite Dangerous Roleplaying Game, is to allow players to sample the ruleset and universe of this exciting new RPG from Spidermind Games and get a feeling for how it works. This standalone booklet contains a single adventure, The Worst Intentions, for you to play. Included are four pre-generated characters including their ship and equipment. Partial rules for personal combat, spaceship combat and ground combat are also included."